Speech as Guest of Honour at book launch of ‘Sargam Tuned’ a MULTI-LINGUAL anthology published by Writer’s Club on 10th July 2016 at IIC. It gives me great pleasure to be here. My thanks to Mr. Pawan Jain, Aagaman Group, for inviting me as Guest of Honour for this event. The launch to take place today is of a multi-lingual anthology of poems titled Sargam Tuned, edited by Amrit Raj and Ruchi Khandelwal, young poets and members of Writer’s Club. I am sure this must be making each participating poet very proud of their achievement and rightly so. It is by taking small steps that we move towards what we want to achieve. it is also a wonderful step taken by Writer's Club to bring into being an anthology that includes some of the languages of India, and English too. I can say the you are a in a good space right now because you have a platform like this, and others, and the availability of social media networking that enables you to put together your poems, get them heard and get them published. when I was your age, there were no such avenues, and poems sent to the few literary magazines often went unaddressed. 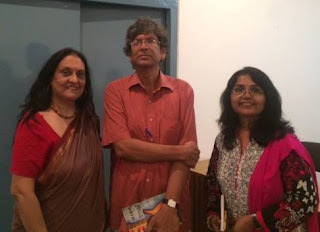 in fact, my poems were selected by kamala Das for Femina, at a time when she was poetry editor for the magazine, but I only got to know of my poems being published in the magazine by a third party. I had to bring this to the magazine's notice, and then they acknowledged it and also gave me a small payment for the publication. But this was just chance that let me know of the publication, otherwise I would have considered my poems worthless perhaps. Now, you have the means to get published, there are many avenues, and you must take full advantage of this. But, you must read a number of poems and poets, for as Shri bajpai has said, we must not forget the traditional methods of writing poetry in our attempts to move into the free verse phase. What can I say about poetry? A wiki definition says that poetry is a literary work in which the expression of feelings and ideas is given intensity by the use of distinctive style and rhythm. Another definition: A poem makes intense use of language, which results in a far greater concentration of meaning than is commonly found in prose. So basically, a few words which carry INTENSE meaning. It calls for ‘Verbal melody and artistic rhyme’. When we start out as amateur poets, often at a very young age because we are experiencing this plethora of feelings, our poems will be raw, full of feeling. As we become better and more experienced poets, our poems gain not only because of our experience, but also because of our greater exposure to poetry and our work become more layered, more concrete and more structured. This is a process like any other in writing. Yet, our poems will connect only through the intensity. I believe poetry begins from a place of pain. That is what drives it forward. Because, if we have a smooth, and often uneventful life, our poems will be just that, light and full of froth. Poems gather depth through the telling of a pain. This pain is an individual and collective pain of humanity, it is both. And through this sharing we can experience/taste each other’s soul for the lines are from the heart and soul more so than the head. Poetry is beauty, sadness, pain, hope, glory, defeat and all else that we spill into it, and all that we read into it. Poetry is not a use of big words or the glorification of a feeling. It should not be cut up and analysed in order to be understood. When poetry is an honest expression of the heart, it will be read and heard and it will be understood. Blue ink spreads for eternity. Singing his song of love. This taste cannot be wrong. and asks if I can feel him. I am happy to say that I received a resounding applause for my poems. And I was honoured to be in the presence of a great poet like Shri Laxmi Shankar Bajpai.